Published on 17 March 2010. The Theatre Royal in Newcastle (the Northern Home of the Royal Shakespeare Company) has a new website today, developed by Firechaser. I don’t know about chasing a fire, but they may need to extinguish a virtual one soon. The Theatre has emailed me to say that my details have been moved over to the new site, and I should login with my email address and the temporary password of “theatreroyal”. Yes, logging in with my email address and that pisspoor non-unique standardised password will give you access to all of my personal data – including my phone number, address, and theatrical interests – plus the opportunity to change my password and lock me out of my own account. Or at least it would, if I hadn’t changed my password. That is a clear and obvious breach of the Data Protection Act’s security requirements – plus, it’s frankly astounding that anyone thought it would be okay. Let’s hope they wise-up soon. 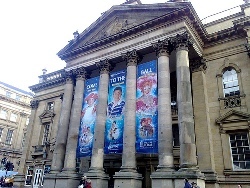 This 1,414th post was filed under: Technology, Data Protection, Newcastle-upon-Tyne, Theatre Royal. Trackback received at 21:48 on 17th March 2010.
sjhoward.co.uk » Quick work . . . Theatre Royal website fixed!